Various programmes marked the martyrdom day of Guru Teg Bahadur in the holy city today. Devout Sikhs thronged various historic gurdwaras to pay their respects and seek blessings. A huge rush of devotees was witnessed at the Golden Temple and Gurdwara Guru Ke Mahal, believed to be the birthplace of the Guru. 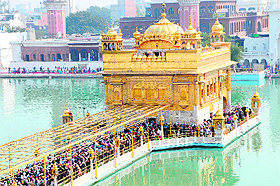 Devotees take a holy dip on the martyrdom day of Guru Teg Bahadur at the Golden Temple. 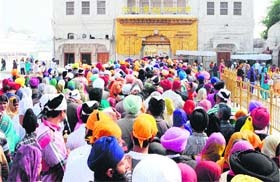 On the 337th death anniversary of the ninth Sikh Guru, devotees started reaching the gurdwaras early morning. 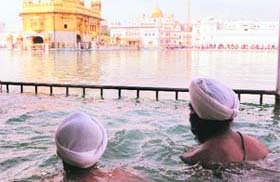 Many of them took a holy dip in the Amrit Sarovar (holy pond) of the Golden Temple. Guru Teg Bahadur was executed in Delhi on the orders of Mughal Emperor Aurangzeb after he refused to embrace Islam. He is known to have made long journeys to places such as Kashmir and Assam in the country to preach the tenets of Guru Nanak. Earthen lamps were lit outside gurdwaras and sweets were distributed among all. The Chief Khalsa Diwan Charitable Society also held a religious programme at its gurdwara.